As a complement to traditional citation metrics, Mendeley readership can demonstrate alternative types of academic influence. The most read article on Mendeley, “How to choose a good scientific problem” (Alon, 2009), has received five citations in Scopus but has 54,629 readers on Mendeley! Furthermore 23% of users with this article in their library are PhD Students. This appears to demonstrate that this article has a much larger impact than that captured by citations alone (retrieved March 6, 2014, view in Scopus / view in Mendeley). Additionally, some early research into the relationship of Mendeley readership with traditional citations has found evidence supporting that Mendeley readership counts correlate moderately with future citations. If you are interested in digging deeper into the existing research on the meaning of Mendeley readership, we suggest starting with “Do altmetrics work? Twitter and ten other social web services” (Thelwall, Haustein, Larivière, & Sugimoto, 2013). 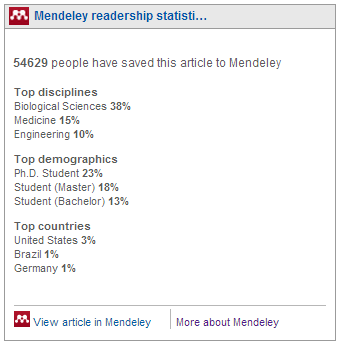 A more comprehensive listing of research related to Mendeley readership statistics can be found in the altmetrics group on Mendeley. We recognize that much research still needs to be done into the meaning of Mendeley readership. Toward this end, Mike Taylor of Elsevier Labs is helping to co-organize the altmetrics14 ACM Web Science Conference 2014 Workshop to be held on June 23, 2014. The goal of the workshop is to improve the understanding of Altmetrics (including Mendeley readerships) and their underlying social media platforms and technological challenges. readers, Scopus expands its role as the abstracting and citation database that demonstrates the most comprehensive view of an article’s impact. 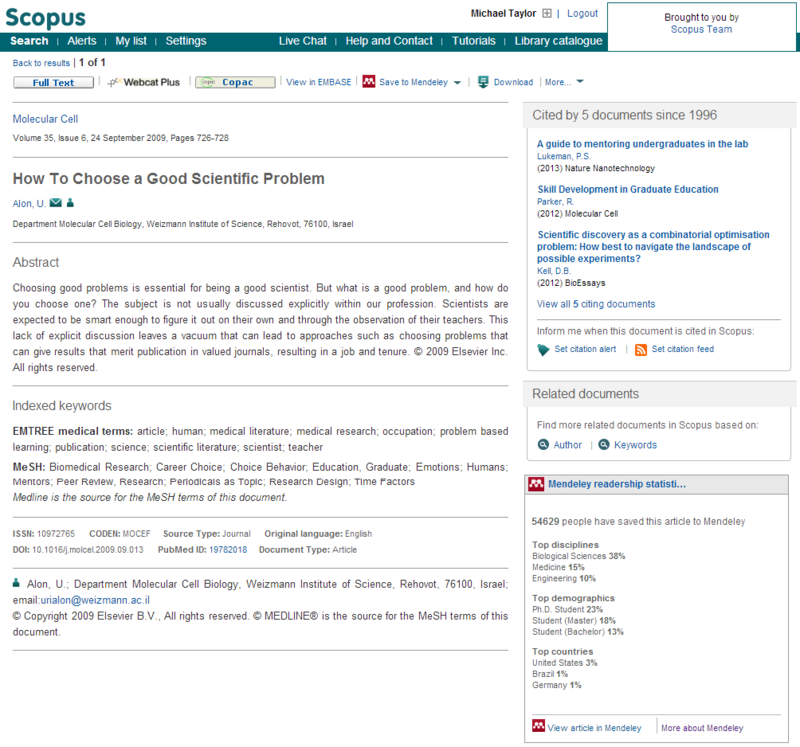 The Scopus team would like to give special thanks Mike Taylor of Elsevier Labs (http://orcid.org/0000-0002-8534-5985) for his efforts in developing this feature. Some technical details: in the beta version, Mendeley readership statistics will only appear for articles where there is a DOI. Readership stats will also not display when using Internet Explorer 7 or 8, or when browsing using a secure (https) connection. For the short term, users may see different Mendeley readership counts in the Altmetric for Scopus widget because that data isn't refreshed as frequently as the Mendeley readership statistics which are displaying current readership. A future version is planned for Q4 2014 that will not have the limitations of the beta version. 10 March 2014 - Stability has been restored. 7 March 2014 - It appears we are having some technical difficulties. The Readership Statistics are not currently appearing consistently. We are examing the issue and hope to have it resolved early next week.